World Cancer Day is no doubt a day that will bring up mixed feelings across the globe. It is a day of reflection, where we must remember to temper the recognition of progress made in treating cancer against the realisation that there is still a long way to go. For some it is a day of quiet thought and remembrance and others a celebration of the struggle they have overcome. 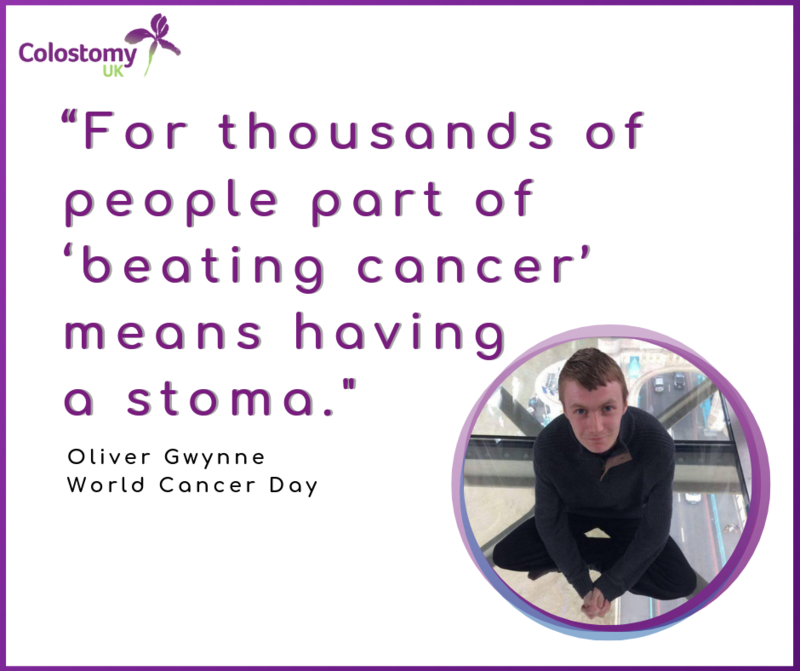 Here at Colostomy UK we know that cancer is often not the end of that struggle. For thousands of people part of ‘beating cancer’ means having a stoma, something that can radically change their life. In stoma surgery a small opening on the surface of the abdomen is created in order to divert the flow of faeces and/or urine. This means that people with a stoma have to wear ‘bags’ or ‘pouches’ to collect their bodily waste. People with stomas are often collectively referred to as ostomates. On paper this sounds like a simple enough change, but the reality is much more complicated. For every person who thrives with a stoma and is given a new lease of life, another will seriously struggle with body image and have anxiety over leaving the house. For many of these people, there will be no one else in their life who knows what a stoma is, let alone what they are going through psychologically or physically. This is where Colostomy UK can help. Colostomy UK is a national charity that supports anyone with a stoma and their wider support circle (friends, family, carers) to enable them to live life to the fullest. Many of the people we support are living with cancer. We are often told by our community that while they are well supported with their cancer, they need more specific support around the practical and emotional challenges of adjusting to life with a stoma. We have a 24/7 free helpline that is answered by ostomates who are trained to give real, experience-based advice on all aspects of living with a stoma. They are also there just to listen, if that’s what the caller wants. We also produce a comprehensive range of literature for ostomates on everything from common issues, like to hernias, to healthy eating and getting active again. Wherever people need help, we will treat them as an individual and do everything we can. So if you are reading this and perhaps know someone that has cancer and has had or is about to have stoma surgery, then please remember to tell them about us. We’re always there, ready to help.